We spot the cloud of dust rolling towards us and we pull over. The man slows, stops. Spit flows from his horse’s mouth. Rider and steed have been traveling for hours in the hot sun. They don’t go much faster than a steady trot because perched on the man’s arm, hooded and calm, is a large and majestic-looking eagle. “Hello,” he replies, squinting down at us in the sunlight. This is my first encounter with a Burkitshi – a Kazakh eagle hunter. We proffer a bottle of water, which he swigs from, and biscuits, which he tucks into his coat for later. He is one of many on their way to the town of Ölgii for tomorrow’s Golden Eagle Festival – the annual gathering of eagle hunters for which some must ride for days on horseback to attend. 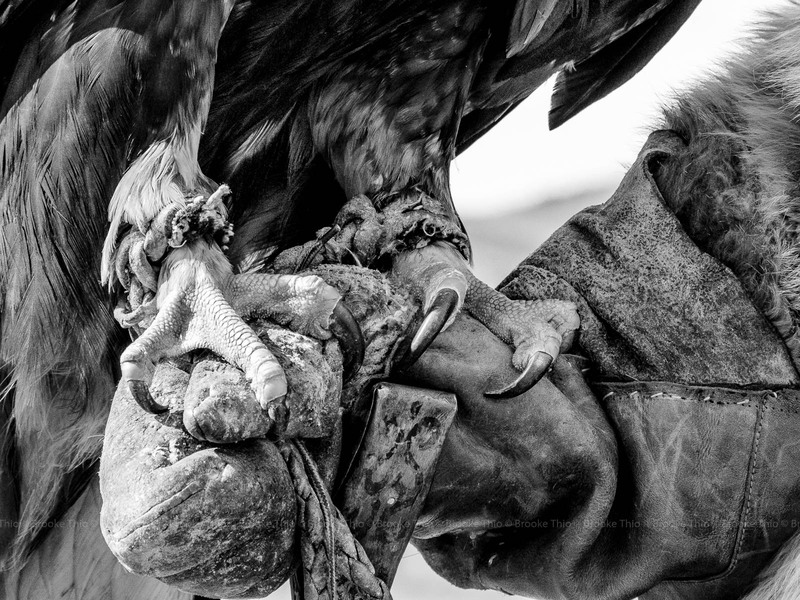 Eagle hunting is a Kazakh tradition and the eagle hunters of Mongolia are ethnic Kazakhs, not Mongols. Most Kazakhs in Mongolia live in the western provinces of the country, where they settled in the 19th century during the expansion of the Russian Empire. Here in Bayan-Ölgii province, roving across endless steppe in our robust Russian-made van, we have to rely on our driver to translate between the Kazakh and Mongolian languages, which our guide Boogie then translates into English for us. Luckily, they know just what questions to ask. We wish him luck, as we did the first, then drive on to meet the local family who will be hosting us for the night. Our host family is located roughly an hour from town, the latter half of which is spent bouncing across a patch of ground studded with hummocks; I cling to my seat for dear life as the van shudders and squeaks. Finally, we disembark next to a pair of gers and I heave a sigh of relief. Some back-and-forth between Boogie, our driver, and the young men welcoming us reveals that the head of the household, a veteran eagle hunter, has gone to Ulaanbaatar on business and that his son will be taking care of us. We’re led to the second ger, which has been set up just for us, and unpack. As we settle in I learn that our host, with a face hewn by the elements, is but 20 years old and already father to a plump baby girl. In the countryside people marry young. “The Kazakh consider girls to be a treasure,” says Boogie as we play with the infant while having tea with the couple, who speak neither Mongolian nor English. “Women run the household: cooking, milking the cows and horses, making their famous embroidery which includes all the wall hangings and carpets, and sewing clothes for the family.” I’m impressed, but also relieved that I won’t ever have to live like this – especially after I try my hand at milking a cow and nearly spill the entire bucket. As the shy young wife helps her husband dress for his trip, we’re informed that the daughter of the family is also training to become an eagle huntress. Perhaps thanks to the attention that documentary The Eagle Huntress has bestowed on the burkitshi community, families are now letting girls take up the male-dominated tradition. Glancing at the baby I wonder if she’ll grow to follow in the footsteps of her mother, or those of her father and aunt. After our young hunter has set off to town, we decide to visit the “neighbors”. It’s a strange experience finding a speck of human life in the distance and driving 10 minutes just to say hi, while city-dwellers like myself will hardly speak to the next-door neighbor for fear of breaking the little personal bubbles we have. But what is scarce is precious, and here the value of hospitality becomes as clear as the white gers against endless grass and sky. Mongolia’s nomads typically move 4 times a year, rotating their pastures, but this larger family is settled in a concrete house that will stay warm until the harshest part of winter. We’re heartily welcomed by the head of the household, a remarkable man; retired but still full of vigor, he speaks directly to Boogii in Mongolian and even addresses us with a few words of English. His family is also getting ready for the festival, and I silently observe the matriarch putting the finishing touches on a coat, impassive to the flurry of activity caused by our visit – even as the old man croons to a dombra. This is the song I sang to my wife when I was courting her, he says. Afterward, they truss up an eagle to be carried to town by van. It takes roughly a week to embroider a coat. At dinnertime, back in our hosts’ home, we dig into a platter of Beshbarmak (meat with noodles and vegetables) together with the young hunter’s wife and younger brother before an early night. The next morning, however, I’m surprised to find our host having breakfast with us. “His eagle got sick last night, so he’s returned for the second junior one. She probably won’t do well in the competition, but it’ll be good exposure. We’ll give them a lift in the van,” explains Boogii. The junior eagle has been, well, quite a headache for the young hunter and all of us. It seems she was caught as a hatchling and is now proving difficult to train. She still can’t perch properly, but worse still, she’s been shrieking through the night. I’ve nicknamed her the Car Alarm. Nevertheless, she’s bundled up and cradled in our poor, stressed young hunter’s arms. Squawking. All the way. There are a record 112 competitors this year, including a special delegation from Kazakhstan as well as six huntresses. After the opening parade, the festival officially begins with a judging of the eagles’ and hunters’ turnout in their hunting regalia, followed by a test of how well-trained the eagles are. Each bird is released from the top of a rocky hill behind the competition ring, where its owner calls and waits; however several of the eagles soar off into the distance instead of returning to their owners and their lures. I’m starting to feel this contest is too risky, but Boogii chuckles and reassures me that the eagles never escape to the wilderness – not until they’re lovingly released by the hunters after 7-10 years together. Over the two days the hunters also compete in Tenge Ily (picking up coins from the ground while galloping on horseback) and Kukhbar (a horseback tug-of-war). By the afternoon of the second day everyone is inebriated to some degree and some of the hunters relinquish their hold on the sheepskin in mere seconds, while others fight for minutes – one pair even tussle to the point where their horses crash past the ring and into the crowd of spectators. Beyond the competition there are side events like camel races and archery games, and of course a flea market and food tents to cater to visitors. Both days of the festival are marked by a bone-chilling wind and thick gobs of cloud that cling to the hills, letting the good light through for only a few minutes at a time, so I sustain myself with doses of coffee and kebabs from the flea market. 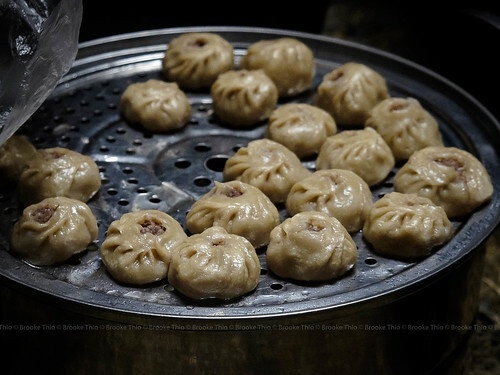 True relief comes only at lunchtime when I can scuttle into one of the many dining gers, peel off my jacket and gloves, inhale the warm greasy air, and get my hands on some hot tea, and kushuur and buuz (fried and steamed dumplings). I navigate the flea market with Boogie in tow just so she can help me eye up the bargains. The Golden Eagle Festival is the best event to shop for fur goods, she explains, as the eagle hunters are the main source for fox, sable, and even wolf pelts. Fur hats here average $20-$30, with the best ones going for $45 if you haggle some. Embroidered rugs, felt slippers, and other trinkets are also laid out, albeit too haphazardly to catch my eye, as the wind keeps throwing its dusty tantrums. As the light of my second day here begins to fade, the scores for this year’s Golden Eagle Festival are finally tallied and winners announced. Competition aside, the camaraderie among the hunters is genuine: they slap each other on the back and yell out hearty congratulations, prancing about on their horses amid the sea of spectators. The Golden Eagle Festival is a reunion and celebration for the Burkitshi, many of whom may see each other only once a year. I can’t understand a word they’re saying, but if I were to guess: they’re probably planning where to go for drinks tonight. Please read my op essay “An eagle’s eye view on Otto Bell’s “The Eagle Huntress” for context to the further females you noticed at the festival and the documentary you mention. It links to a research article by historian Adrienne Mayor showing that there have been other eagle huntresses contemporary to Aisholpan and also in antiquity. In fact Amanbol, the girl in pink you show above, is one of the girls who apparently had also been in training at the same time if not prior to Aisholpan. The idea that the men-carte blanche- would not ‘allow’ female participation with the exception of Aisholpan’s family is a result of the filmmaker’s agenda to create a male foil for his film. He created that idea that there was a “misogynist” barrier for Aisholpan to overcome and I know this from speaking with someone who worked closely for the filmmaker for a time. So I would just caution you to be aware of that. To know what I am talking about you will have to read my op essay. I have been tracking the story since 2014 and my op essay took 7 months to research from the time of Sundance film festival and I sit (uncomfortably) on the secrets of 6 to 2 people directly and indirectly as a result. One VERY informed local told me that “the whole town does not talk about the film because everybody knows it is made up story”…the reason the person does not speak up? “Tourism is good”. I will keep my comment short and sweet in that regard. I would love to know who the other 6 females were at the festival. If you can, please let me know or supply a lead on how to find out quickly. A woman named Dinara Assanova has created a small exhibit on eagle huntresses to as a “civic response” yo the filmmaker’ media marketing and she would love to get their names so she can follow up. She heads Women of Kazakhstan. Thanks! P.S.S. 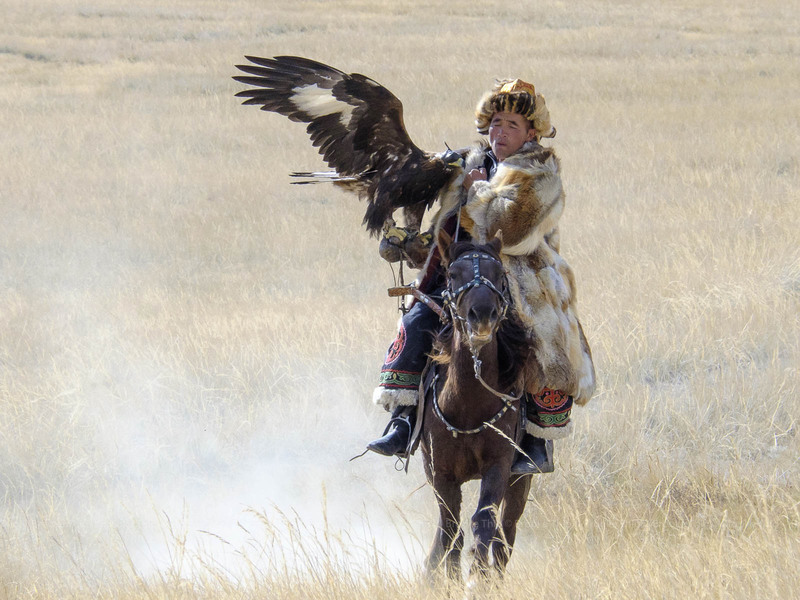 I think you may know this but the eagle fest started in 1999, is privately owned, and was created to try to extend the tourism season on Western Mongolia….along with celebrating nomadic traditional culture and skills. P.S.S.S.I enjoyed it in 2014 as an independent backpacker and that is where I met Aisholpan and I ended up staying with her family for three days following the festival. Thank you Meghan for the very thoughtful comment! I did come across Adrienne Mayor’s article when researching on eagle huntresses and have also heard about ethical issues regarding the film, hence I didn’t claim that Aisholpan was the first huntress in known history or did I dwell on the gender aspect 🙂 Last year’s festival set a record in overall number of participants and there was even a corporate sponsor, so the locals are obviously benefiting from it. I couldn’t be sure if the girl I shot is Amanbol as I didn’t get the chance to speak to any of the huntresses (was staying with another family). It does seem to be the same coat though. Sorry I can’t be of help here. From a destination marketing viewpoint, the film did achieve its purpose: to provide an overview of the eagle hunting tradition and drive tourism to western Mongolia through a sensational story angle. It’s not for me to comment on contractual issues or “staging” of scenes, but I’ll edit my piece to make it clearer that gender has never been a hurdle for female eagle hunters. I absolutely adore this post, and your photographs are stunning! Mongolia has always been a country that’s intrigued me but one I know very little about. Now I know a little bit more though 🙂 Out of interest, did you travel Mongolia independently or as part of a tour? Thank you! I was there for a photography workshop (hence the slightly better photos than usual) and our itinerary was handled by this company: Zendmen Travel Mongolia. What an amazing story indeed!!! Your photos are amazing, this place looks so unreal.. This looks so cool! I have a bit of a Mongolia obsession and this looks like an awesome thing to be there for! Wow, I’m not sure which to be impressed by more: your writing or the photos. I love your narration! The kind where I feel so happy to have come across a wonderful blogger’s work. And your photos are really outstanding! Next, this experience is out of this world to me, something I think I’ll get to see from TV or documentaries. Now I cannot wait to explore your other posts here as well as read more about how travelling to Mongolia will be like. Mongolia is definitely on my bucket list, I yearn to find out for myself how staying in a ger or to live in such wide open spaces will be like. Gorgeous photos and beautiful writing! I hope one day I get to see this in real life, but for now your writing and images are a great glimpse into a different world. Just one question, not sure if I missed it, but what is a dombra? What an amazing article! I felt as if I were there with you. Now my heart aches to go to Mongolia even more than before! Beautiful words and beautiful photographs, it must have been such a precious experience to live! Goodness me, what incredible photos! The one of the man sitting in the truck, shrouded in darkness is my favourite. Thank you 🙂 I’m so glad you asked about the loos…you should be very afraid. There was a cluster of three pit toilets for women, no doors, barely any tarp cover. Us tourists tried to queue up but most of the time people were peeking into each stall to see if the “cubicle” was occupied! Your photos are beautiful. I saw something quite similar in Kyrgyzstan, games of Kok boru with a headless goat. Would love to visit Mongolia one day. It’s a really interesting region of the world. This is very interesting to read. I am actually planning to visit Kazakhstan in the end of May. So nice to read that this is in fact a Kazakh tradition. The dumplings look pretty nice. Your pictures are very beautiful. It was a joy to come across this article on my saturday morning. Wow! You had quite a special experience watching the competition and experiencing a slice of the nomadic Mongolian lifestyle. Wow. What a beautiful story with such stunning photographs. I have always been curious about Mongolia as I know next to nothing about the country so thank you for giving me some insight! It’s like something out of a fantasy film!